I bet YOU didn't commute to work today holding your breath the entire way. I sure did. Halloween 2013 morn started off GREAT! In case you've been living under a rock and didn't hear the news...The Red Sox won the World Series!!! There was much happiness and joy in the Trenches. In fact, the boyz didn't even mind that they had to get their flu shots in the morning. They were able to sleep in a little bit after a long night of TV-watching and cheering. Once flu shots were administered, it was off to school for the 3 of them. And then I was back at the school at noon for "pumpkin carving" with Baby's 3rd grade class. (Why oh why do I commit to these things?) So it was me and a group of 4 boys (including Baby) cutting pumpkins open and counting the seeds. Fun times! Baby was a little off, I could tell (Clue #1), but I totally attributed it to his late Red Sox night. Sorry I don't have any pics to commemorate this event. Because 3rd graders. And pumpkin guts everywhere. When it was time for me to go, Baby sort of started having a mini meltdown (Clue #2), saying he please please please wanted to go home with me. I negotiated, telling him that if he were to leave school early and come home with me, that he'd have to immediately take a rest. He agreed. Without hesitation (Clue #3). Are you picking up what I'm putting down yet? We literally were around the corner from home. All over. Everywhere. The car. Him. His open backpack. So after stripping him nekkid in the front yard and immediately throwing away all the clothing he was wearing (for some reason, it got on his socks but not even a speck was on his sneakers? Puke works in mysterious ways, man. You can quote me on that), he scampered into the house to shower while I was left to deal with the aftermath. It was just me, my steely resolve resignation, and some trusty paper towels. An entire roll of paper towels later, with the help of Clorox with bleach spray and Resolve carpet cleaner, I managed to get my car "clean". Ish. Except for the fact that there was vomit underneath the seat cushion that I tried my best to reach, but probably not 100% successfully. Based on the smell that lingered. So that's why I drove to work today holding my breath. With all 4 windows (and the sunroof) open on the Mass Pike. Needless to say, my car is being completely detailed tomorrow morn. Aside from the afternoon of vomitage, the rest of our Halloween went swimmingly. Eldest was Willie from Duck Dynasty. 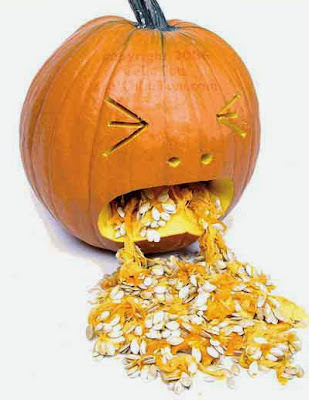 Here's to a late night baseball-free, flu-free, puke-free November! At least he still had it in him to trick or treat! Poor thing- and poor you!